Clip-On Air Chuck Use With Tire Changers Haltec H-5265OP / Bowes HT H-5265OP. 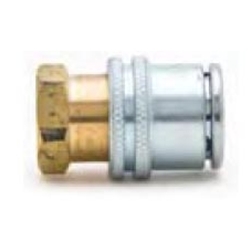 The H-5265 is a specially designed air chuck that locks onto the cap threads of a Standard Bore valve stem when the sliding sleeve is pushed to the forward position. The chuck releases when the sleeve is pulled back. Available for use with tire changers. Order H-5265 OP.